Ahi both big and small were the main catch this month. I’m not just counting charter boats but also the many small boats that have been hanging around F buoy. It more resembles a parking lot on the ocean out there with most of the boat sizes ranging from 18 feet to 21 feet. Trying to get in where the tunas are with a big charter boat trolling is nearly impossible and if you do manage to squeeze in between, it makes them mad because they know that your boat is probably scaring the ahi and making them go deeper. I gave up even trying the buoy and tried my luck on the ledges and that’s where I found mine. Some of the small boats have also found out that they’re on the ledges too. August is usually a good month for marlin but one of the main determining factors of how many are caught in a month is how many boats are out there trying for them. The later part of August is always slow for tourism and with the recent lava flows and then a couple of hurricane threats, tourism has been even slower than normal. I’m sure there’s some nice marlin out there but there’s little effort going out to catch them. Ono is a summer time fish and the bite should be hot but I would have to say that the bite all summer long has been more ‘lukewarm’ than hot. Mahi mahi are actually more abundant than ono and it’s off season for them. The spearfish bite usually slows down this time of year but there are still some out there. This is the time of year that the otaru tunas should be here in abundance. They did finally show up but late in the month. I haven’t been out in a while due to the slow tourist season but when I do get out there, I don’t think there are any other charters that do a better job of catching those tunas than me. I’ve learned a few tricks over the years. I didn’t do much bottom fishing this month and when I did, it was mostly speed jigging. Although very labor intensive, it’s both fun and tiring. I actually catch bigger fish using tuna chunks and it’s a lot less work than jigging. I really don’t mind working hard to catch fish though. What I really don’t like is dragging lures around all day hoping for a bite. If the trolling bite isn’t really happening, it’s boring for both me and my customers. Being bored can be almost as tiring as hard work. That’s why I like to break up the day with some bottom fishing (ummm…catching). 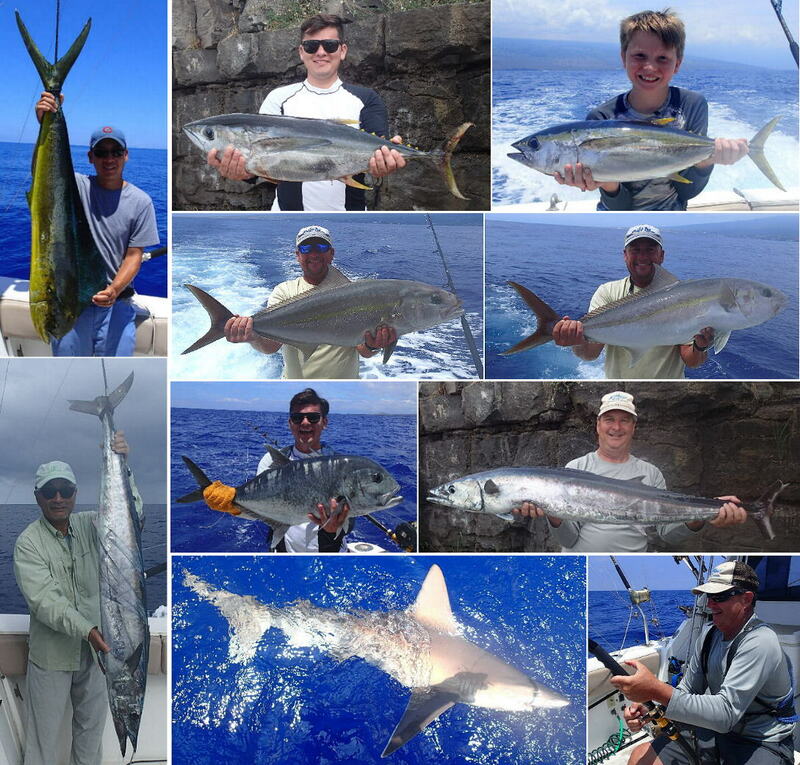 ← Kona Hawaii Fishing Report – July wrap-up.